Walter John Travis was born in Maldon, Australia, on January 10, 1862, the fourth of eleven children born to Charles and Susan Travis. As a child, and later in life, Walter J. was described as “slight of build, with above average intelligence”. He was a very successful student, and displayed a very special knack for writing and a keen interest in several sports. As a young man, Travis actively engaged in hunting, tennis, and cricket. In 1885, Travis’s employer, Mclean Brothers and Rigg, a hardware company with offices in the major cities of Australia, decided to open an office in New York City. They offered 23 year old Travis the job of managing the new office. It was an opportunity that the young Travis could not refuse. Interestingly, Travis never returned to his homeland. Travis threw himself into the New York City social and recreational scene. In addition to hunting and fishing excursions with friends, Travis devoted considerable time and energy to competitive bicycling. He was often seen riding a unicycle through the streets of New York. His innate competitive spirit would emerge when he refused to permit another cyclist to pass him on the road. During these early days in New York City, he formed habits that lasted throughout his lifetime, including the regular enjoyment of Ricoro Corona cigars, Old Crow whiskey, and evenings of poker and billiards. In 1889, Travis had a life-changing encounter when he met the daughter of a wealthy Connecticut businessman. Anne Bent was 26, and an attractive young woman who lacked the stiff formality of many young women Travis had met in the New York social scene. He was hooked!! It is reported that Travis often wrote to Anne three times a day, as attested by the USGA collection of over 100 of his letters written during the Summer and Fall of 1889. Travis proposed to Anne not long after he met her, and was eager to marry as soon as possible. Anne, on the other hand, was adamant about waiting, and insisted on visiting her sister in Buffalo, NY, during the summers. Finally, after a long year of agonizing delay for Travis, Anne Bent and Walter Travis were married on January 9, 1890. Later, in 1890, Travis became a naturalized U.S. citizen. 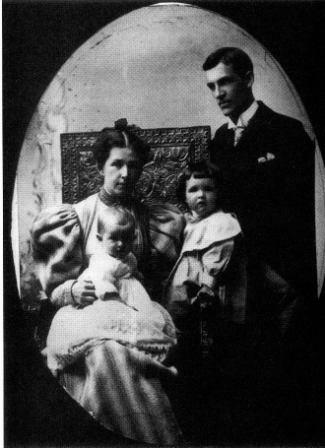 Walter J. Travis with his wife, Anne, holding their infant son, Bartlett, and 3-year old daughter, Adelaide. Walter and Anne settled down in their new home in Flushing, NY, where they would live until their move to Garden City, NY, in 1900. Their first child, Adelaide Augusta Travis, was born in 1891, and their second child, Bartlett Herbert Stephen Travis, arrived in 1894, just two years before Walter would touch a golf club for the first time.